Team Foundation Server 2013 Update 3 came with Visual Studio Release Management vNext. 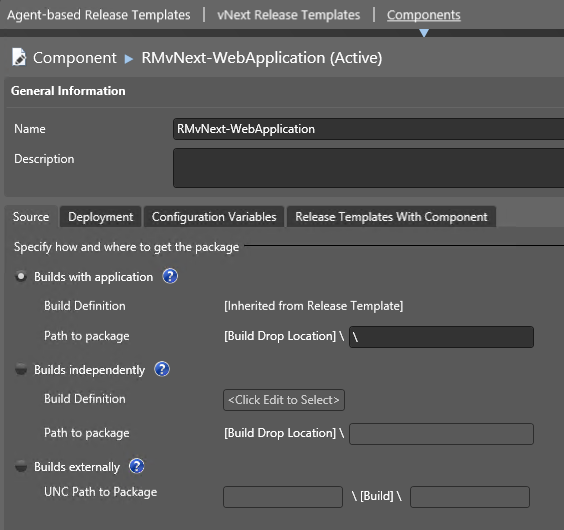 vNext is, next to the deployments with agents, another way of doing deployments with VSRM. 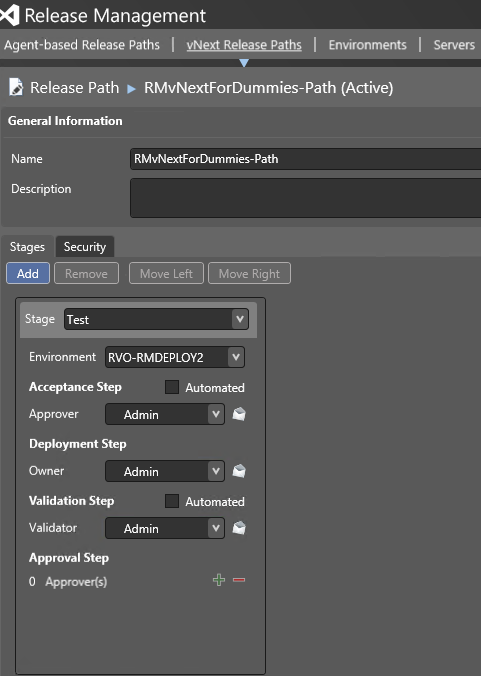 The most important thing in vNext is that you can do deployments to machines, without having to install an agent. This is because VSRM vNext uses Powershell Desired State Configuration (Powershell DSC) as the tool/engine to execute powershell on different machines. Powershell DSC is fairly well documented, but VSRM vNext not really. There is a great blog serie of Colin Dembovsky (here) that goes fairly deep into the engines, and there is good starter from Jeff Levinson, but there was no post that I could follow to start a vNext release from scratch. So I decided to figure it out with help of the blogs I found and write a post that walks through all the steps without making it too complicated. Instead of walking you through the steps by creating all the prerequisites first, I will use my own way of thinking and starting and set this all up. Run to test the solution. If you want to make it pretty you can always change the color or the title. Check in the solution in Source Control in your newly created Team Project. Easiest way is to just right click the solution and choose [Add Solution to Source Control], Choose the right Team Project to add the solution to, Navigate to the [Pending changes] hub in Team Explorer and check in your changes. 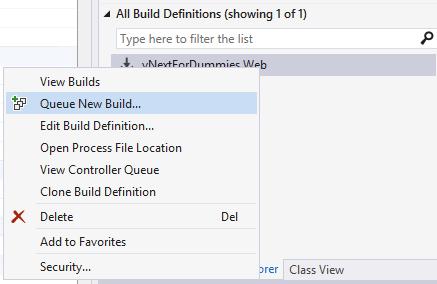 Navigate to the [Build Hub] in Team Explorer and create a [New Build Definition]. Leave everything default. on the [Build Defaults], fill in a valid drop location, and on the [Process] Tab, make sure you selected the solution you just created. Run the build to check if it builds successfully! Start up the Release Management Client and navigate to the [Administration | Manage Azure] Tab. Click [New] and fill in the details that are asked. The information that should be filled in is described perfectly on MSDN. Click this link and follow the steps described here. 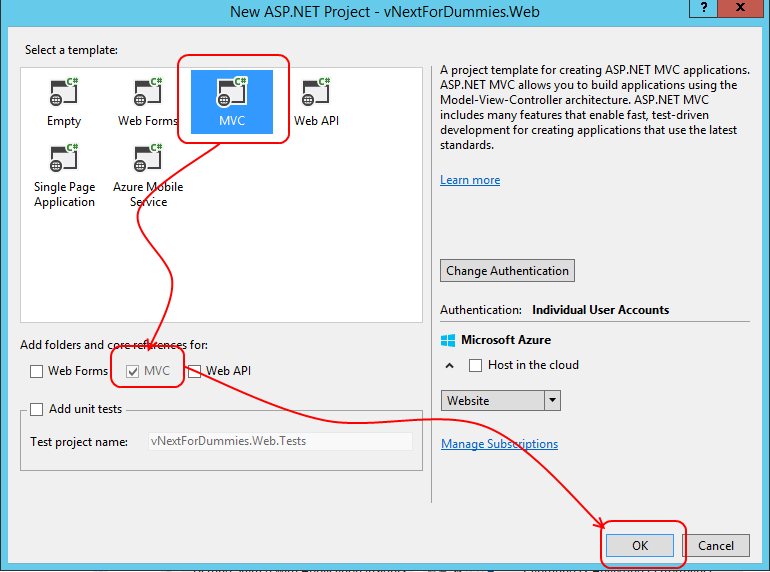 Now create a Virtual Machine with Windows 2012R2 on Azure. Do nothing yet on this virtual! No we need to create stages (our deployment pipeline) and a release template. For this, follow the steps described here. Keep it simple and add only 1 stage ! Now..No further hassle, I want to start a release! 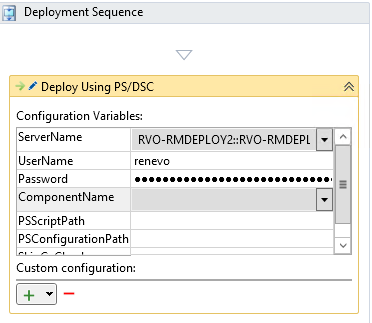 Drag the [Deploy using PS/DSC] to the surface. When you try to choose the [Componentname] it cannot be chosen yet. In order to do this, you need to add the component to the toolbox first. 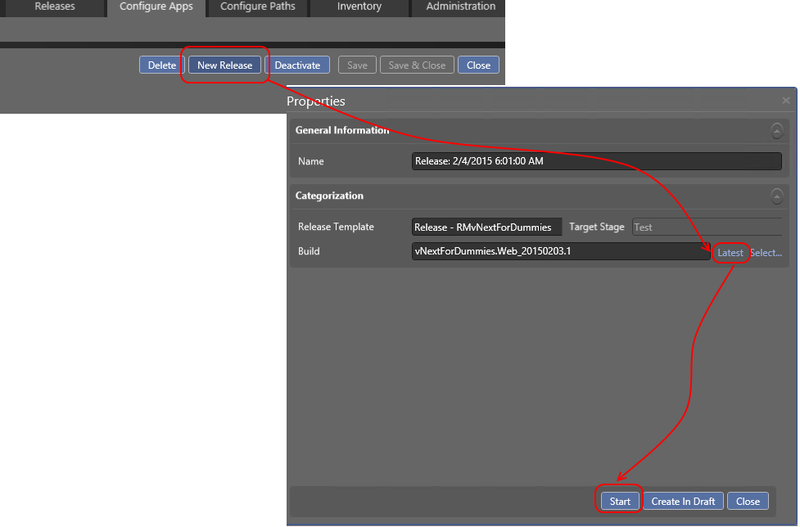 Right click the components “folder”in the toolbox and add the component. Now select the ComponentName. and trigger a [New Release]. Select the latest build and start. You ‘ll end up in an approval screen where you can approve the release of the first stage. Approve it and watch what happens. Sure ! I know that we don’t have a PowerShell DSC script yet do do anything, but we can try to make the communication work first. At this point I started to think about a blog post, because my first release (after a long long wait) failed ! Looking at the log file, it showed the following (somewhat cryptical) message. machine.cloudapp.net on the port:<port> due to unexpected exception. WinRM service is enabled and allows access from this computer. to remote computers within the same local subnet. Solution: This had something to do with the firewall on my on-premise network. The Remote Management Port (default on 5986 and 5985) was not open. I made sure I could access this port and validated that by doing a telnet session to my machine. Open a command box and type telnet machine.cloudapp.net 5986. When a blank screen appears it means you can access the port. machine.cloudapp.net on the port:5986 due to unexpected exception. The SSL certificate is signed by an unknown certificate authority. So what does this mean. After some searching I found out that you receive this error because the target machine is not part of your domain. You can solve this in 2 ways. 1. Set the SkipCaCheck in your Release Template to true. This skips the check for the certificate. I chose this one for my further post because it is the easiest way and the closest to Release Management. And we run again, and again I got an error! One or more errors occurred. ---> Microsoft.TeamFoundation.Release.Common. service executable path VisualStudioRemoteDeployer.exe . What now…My account is an admin account.. With some help of the Visual Studio Product Team, I figured out that you should prefix your username in RM with a domain and slash. So instead of [renevo] it should be [.\renevo]. And we run again! YES ! We made it. We have our end-to-end scenario. 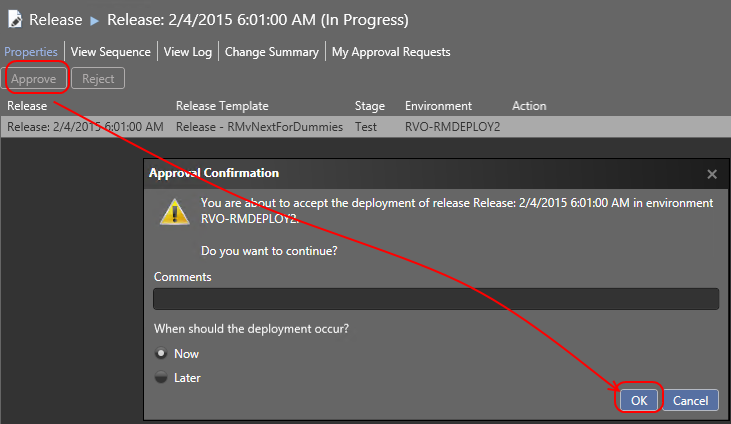 Deploy (doing nothing yet) succeeded and we are in the validation step. The steps performed are. Upload all the build output to your azure storage. You can check this by logging in to your azure account, navigate to storage, select the storage you configured in RM and choose container. There you see the files from the build. On the target machine you have a directory [DtlDownloads] in you c:\windows (c:\windows\dtldownloads). Here you find all the files downloaded from storage and ready for further processing on your machine. Now that we have our connectivity, we can start building some DSC. There are some good posts around the internet about DSC and also some in combination with Release Management. You can find those in the resources section at the bottom of this post. For now , I will suffice by copying the website bits to the inetpub/wwwroot directory on the target machine. The DSC script we want to execute must be send to the server as well. The easiest way to do this is to make the DSC part of the build. Open your web application, and add a folder DSC to your web application. Add a file CopyWebSite.ps1 to this folder and put this in the file. SourcePath      = join-path $applicationPath "_PublishedWebsites"
Make sure you replace MACHINENAME with the name of your target Azure machine. Make sure you set the file properties in VS to Copy Always so that your file ends up in the build. Check in the file, run a build and start a new release. When this succeeds, you have configured a IIS, Framework 4.5 and copied the bits of your build to a directory. Now try more with DSC. Follow the posts listed below for more advanced use. René, Great post. I had pieced together information like you until I found this! 1) You’re using Team Foundation Server for builds, I am using VS oline; is TF Server required on the RM server or client machines? 2) I set up a new Azure VM for the deployment target, then ‘Do nothing with this virtual’ am I supposed to follow the configuration in the provided link to agent-less RM deployment? a) can I set up a RM agent to accept the bits by way of the DSC sript? b) seems the scrip provided — thanks — doesn’t configure IIS, should that be done before the first release? 3) The error I get is ‘The term ‘C:\Windows\DtlDownloads\CI Test\Copywebsite.ps1′ is not recognized as the name of a cmdlet …’ and the script is in C:\Windows\DtlDownloads\CI Test\_PublishedWebsites\AppForHTML-CI\bin any advice on fixing that will be appreciated. The idea of setting up the communication and confirming that it works before attempting to deploy is great. The ‘gotchas’ that you provide undoubtedly will save a lot of people time thanks! Thanks for the link, that isn’t really it. to get the .ps1 to execute. So, does this relate to the ‘Join-Path’ in the DSC script? We did put the script in a DSC folder in the application. I’ve been writing software for a while, but this part is all new to me (CI, RM, Build Agents, TFS, TeamCity, Git, etc.). I’m in the middle of learning and getting everything set up. It’s a project! More specific: Does this subject matter preclude the use of a TeamCity/TFS combination? I’m pretty well settled on that duo for TeamCity’s NuGet feature, which I’m going to need. But I like the concepts presented here. I’m just a little hazy yet on how it all fits together. Hopefully I’ll be able to use this together with my TeamCity/TFS setup. 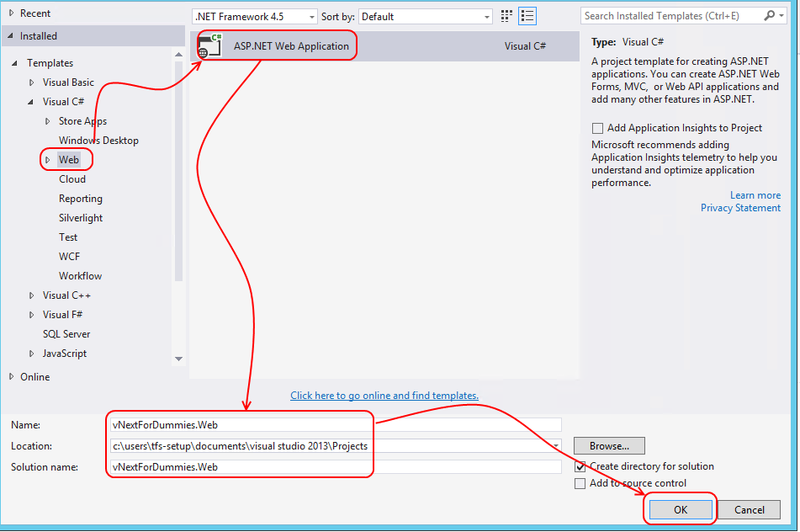 I think the easiest way is just read through the pages here https://www.visualstudio.com/get-started/overview-of-get-started-tasks-vs to get a Good overview of All the different aspects of ALM. Thank you for the handy general reference. I’ll be able to make good use of that. So it looks like it is indeed possible. In fact your post and his make a nice pair.